DU B.Ed 2019: The Application Form of Delhi University for B.Ed 2019 session is likely to release from 7th May 2019. Department of Education of Delhi University conducts entrance examination every year for the admission of the candidates to B.Ed course. The Application Forms of DU CIE B.Ed 2019 will release online on the official website and have to be submitted by the candidate before the due date. The candidates who are interested in pursuing the course further will have to fill up the Application and submit it before the due date. The admission to the course is provided on the basis of the score secured by the candidates in the entrance examination conducted every year. It must be noted though that there will be no separate Application Form of DU B.Ed and the University will release the common PG Application Form which has to be submitted for the B.Ed Program. The candidates who will be qualifying the entrance test will be eligible for the admission to the applied colleges of Delhi University. For more of the details of DU B.Ed 2019 go through the article below. New: The Application Form of DU 2019 will be released in an online mode. The forms will likely be available from 7th May 2019 onwards and the last date for the submission will be in the last week of May 2019. The direct link of the Application Form will be available here. The candidates who will be applying for the B.Ed course will have to keep themselves updated with the latest released information available on the official website of the Department. The schedule will be available mentioning all the important details of the admission procedure. Candidates are advised that they keep visiting the website on a regular basis and must download the officially released schedule of DU B.Ed 2019 so as not to miss any of the important events of the admission procedure. Find the schedule of DU CIE B.Ed 2019 in the tabular format below. Any form of changes in the dates will be updated here. The Application Form of DU CIE B.Ed 2019 will be available on the official website of Delhi University. It is an important part of the admission procedure which has to be followed by the candidate. It must be noted that the DU B.Ed department will not release the Application Form separately and candidates will have to fill the DU PG Application Form to apply for the entrance test of DU B.Ed 2019. The Application Form has to be provided will all the details as asked in the form and the details must be provided with the utmost care. The Information Brochure will also be released along with the Application Form and the candidates applying are advised that they must go through it thoroughly so as to avoid any form of error while filling up the form. The details to be provided in the Application Form will be of the personal information, Contact details, Academic Information and the uploading of the photograph and the signature as per the specifications mentioned in the Information Brochure of DU B.Ed 2019. It must be noted that the details mentioned in the Application Form must be valid and correct as any form of misleading detail will lead to the cancellation of the candidature. The details entered will be cross-checked at the time of the final admission by the Department to the original documents. The final submission of the Application Form will only be after the payment of the Application Fee. It is advised that the candidates must get the photocopy of the submitted Application Form for the future purpose. Visit the DU PG Admissions Portal link and register yourself. Keep the record of the E-mail ID and the password you use to register yourself at the portal as it shall be required for logging in later on. Follow the instructions given on the portal to complete the application procedure. Select the Teaching Subject. You can select only one subject. Select the examination centre from the given options where you would prefer to appear for the entrance exam. After the payment is made, please keep a printed copy of your application form as it shall be required during the time of admission. The candidates applying for the DU B.Ed Program must make sure that they fulfil the eligibility criteria as defined by the Department of the Education. The eligibility is an important part of the Admission procedure which must be gone through by the candidate. The eligibility in detail will be mentioned in the Information Brochure and the official notification which will be released by the Department, candidates must go through it thoroughly and must make sure that they satisfy each and every criteria as prescribed. In case the candidate applying for the B.Ed program is found not abiding by the defined eligibility, they will not be allowed to proceed with the application form further. It is advised that the eligibility is read very carefully by the candidate before proceeding for the Application form. Candidates must have a Bachelor’s or Master’s degree in Science / Social Science /Humanities/ Commerce or any other qualification considered equivalent with minimum 50% marks. Candidates must have a Bachelor’s degree in Engineering or Technology and specialization in Science and Mathematics with 55% marks or any other qualification considered equivalent. NOTE: ST/SC candidates will be eligible to apply on passing the qualifying exam with the minimum pass percentage required for admission into a postgraduate programme of DU. OBC Children/Widows/Wives of Armed Personnel, including ParaMilitary Personnel, killed/disabled in Action (CW); Persons with Disabilities (PwD) category candidates will be allowed a concession of 5% marks. The candidate must select one of the subjects given in the following table as his/her teaching subject. It shall be considered while preparing merit list for admission and can’t be changed at any cost. Candidate must have studied the subject he/she selects as a teaching subject while pursuing the Bachelor’s or Master’s degree for atleast 200 marks and must have obtained 50% in the subject. Candidates opting for Sociology, Psychology or Commerce as teaching subjects should have essentially done Post graduation in the respective subject. Candidates with a B.Com degree can opt for any subject except Sociology, Psychology or Commerce provided he/she has had studied the subject during graduation. Candidates opting for Home Science must have a B.Sc Home Science degree. Candidates having a Bachelor’s degree in Mathematics (Hons./Pass) are advised to choose Mathematics as their subject. Candidates applying on the basis of a Postgraduate degree in any of the Science subjects offered at school level can choose Physics / Chemistry / Biology / Home Science/ Mathematics as their teaching subject. Candidates applying on the basis of a Postgraduate degree in any of the Social Science subjects offered at school level can choose History / Geography / Economics / Political Science as their teaching subject. The Admit Card of Delhi University B.Ed Program is an important document which must be presented by the candidate on the day of the exam. The Admit card will be available in an online mode and will be on the official website of the University. It is a mandatory document which must be presented on the day of the exam and its absence will prohibit the candidate from appearing for the entrance test. The Admit Card of DU B.Ed 2019 will be available as per on the scheduled date as announced by the Department and candidates will have to provide the login details in the link of the Admit Card. The details in the login section must be valid and correct, the incorrect information will prohibit the candidates from downloading the Admit card of DU B.Ed 2019. The Admit Card of Delhi University provides the validation to the candidates to appear for the entrance test of the B.Ed program. 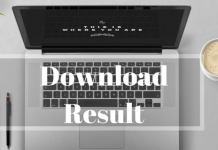 The details mentioned on DU B.Ed Admit Card 2019 has to be verified by the candidate once the document is downloaded. In case the details mentioned are found to be incorrect and invalid, the candidate will have to contact the examination conducting body of Delhi University immediately. The information provided in the Admit card will be the Name of the candidate, Application Number, Roll Number, Date and the timing of the exam, Centre allotted to the candidate for the examination, Course Name and the instructions to be followed by the candidate on the day of the exam. The candidates must get multiple photocopies of the Admit card on the day of the exam, in case the downloaded one gets lost or damaged on the day of the examination. It is also important that the copy of the Admit card is retained ill the admission procedure is over. B.Ed. is a two year full-time programme. It is not permissible for B.Ed. students to take up any employment (full-time or part-time). Neither are they allowed to pursue two degree courses simultaneously either from the University of Delhi or from other University except the part-time diplomas/certificates of the University of Delhi. The total number of seats offered in the B.Ed. the programme is 350 (Excluding 5 % supernumerary seats each for PwD, CW and Foreign Category candidates). The admission to the B.Ed programme is decided by the merit of the applicants in the entrance examination held for that purpose. Negative marking: 1 mark to be deducted for each wrong answer. There will be one common entrance test for all the candidates applying for the DU B.Ed programme irrespective of the Teaching subject they have opted for. The test will consist of questions from school level Science, Social science and mathematics and language comprehension in both English and Hindi, reasoning, teaching aptitude and general awareness on social, political and economic issues. 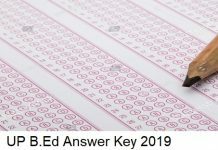 Answer keys help in increasing the transparency in the results of the entrance exam. The candidates can calculate the score they can expect in the results and also file the grievance for correction in case any discrepancy is found in the answer key. The answer key will be made available by the department on the admission portal 24 hours post the entrance exam. The candidate can visit the website and download the answer key. Complaints, in case of any discrepancy, can be registered within 48 hours from the release of the answer key. The Result of the entrance exam conducted for the admission to B.Ed course will be released in an online mode by the examination conducting body of the University. The availability of the Result will be as per on the scheduled date as announced in the admission schedule. The candidates will have to keep visiting the website of the Department on the regular basis so as not to miss any of the important events. The selection of the candidates will be as per on the basis of the marks secured by them in the entrance test, category to which the candidate belongs, number of available seats in the program and the number of the candidates qulaifying the entrance examination. The Result PDF can be accessed by the candidates by providing their required credentials in the login section of the Result made available by the authorities. Once the Result of DU B.Ed Entrance exam will be declared, the candidates will be eligible to proceed with the admission procedure further. It must be noted though that merely qulaifying the entrance test will not provide any form of assurance to the candidates for the admission to the course and the final seat allotment will only be after the release of the Admission List. Once the Result is declared after the successful codncution of the entrance exam, the candidates will have to keep visiting the website for the release of the Admission List as it will mention all the important details reagrding the admission procedure further. It is advised that the Result PDF which will provide the candidate’s Result status must be downloaded by the candidate and they must have the photocopy of it for the future references. Once the Result of DU B.Ed 2019 is declared by the authorities, the authorities will also release the Merit List or the admission list on the Department’s website. It will be important for the candidates that they keep visiting the website on a regular basis so as not to miss any of the important details regarding the Admission List. DU B.Ed Admission List will mention the names of the candidates who are eligible for the admission and will be provided with the dates of submitting the Admission fee and the documents for the final admission to the course. The release of DU B.Ed Admission List will be as per on the date as provided by the authorities. The candidates must note that the multiple admission lists will be released mentioning the names of the candidates. The selection of the candidates will be on the basis of the marks secured by them in the entrance exam and the category they belong to. It is advised that the candidates must go through the details mentioned on the Admission list thoroughly and in case if any form of error is found, the applicant contact on the available helpline numbers mentioned on the website of CIE. Soon after the declaration of results, the department shall release the Admission lists on the website of DU. The admission list shall contain the name of the candidates shortlisted for admission and the institution they have been allotted. The time period for admission shall also be notified. If a candidate fails to report within the appointed date, his/her seat shall be cancelled and allotted to other candidates in the merit list in the subsequent lists of admission. The selected candidates shall have to accomplish the admission related formalities by visiting the institution allotted to him/her within the stipulated date and time. The admission shall be complete only after the payment of the fee as notified by the institution. High School/Secondary School Certificate for verification of date of birth. A detailed Statement of Marks in Graduation Parts – I, II, III and in case of Postgraduates also the Master’s Degree Statement of Marks. Provisional certificate or degree of the qualifying examination. Relevant certificates/documents from a competent authority, establishing the candidate’s claim for reservation, for candidates belonging to reserved categories. Character Certificate from the institution last attended or any gazetted officer (valid for six months from the date of issue). In the case of candidates in service, a No Objection Certificate from the employer and a letter of sanction of study leave for a period of two years. Two latest passport size photograph. In addition to this, there shall be supernumerary seats for PwD, CW and Foreign nationals as per DU norms. NOTE: Up-gradation to another institution for B.Ed. Programme in the subsequent merit list is not permitted. There shall be no provisional admission for candidates whose results haven’t been declared. However, they shall be considered for admission in the subsequent lists of admission if: They report to the institute when their names appear on the merit list. Seats are available in the particular subject category when the candidate reports with the result. Note: The supernumerary seats are excluded from the available 350 seats. Good luck to all the candidates appearing for the DU B.ED Entrance Test 2019. For updated information do keep visiting our website. We would very much like to help you with your doubts. Please write your doubts and Questions, if you have any, in the comments section below. We shall get back to you at the earliest possible. I did MBA (finance) from SMU. Am I eligible for b. Ed or not if yes then which sub. Yes, you are eligible to appear for B.Ed entrance exam. Your teaching subject must be the one which you had in your Bachelor’s or Masters. You can find the options in the article. After graduate i can do b.ed 2 year course from du. 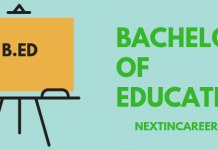 Yes, you can do B.Ed after your Graduation.